If you like video games, chances are that at some point you’ve played one of the many Pokemon games that exist on older consoles, ranging from the Gameboy to the Nintendo 3DS and now the Nintendo Switch. The newest Pokemon game Pokemon Let’s Go manages to keep the nostalgic feeling of games like Pokemon Yellow by using similar layouts and the original 151 Pokemon, but updates visuals and everything else to make it feel much better on a modern console. With a mix of streamlined Pokemon catching mechanics from Pokemon Go, clever dungeon puzzles, all those trainer battles and a personalized-feeling gaming experience thanks to the choice of a partner Pokemon, Pokemon Let’s Go combines old and new concepts well to make Let’s Go echo the greatness of its source material while being simple enough to make it enjoyable now, and this easy-to-pick experience in my first return to the world of console Pokemon games is one I’m glad that Let’s Go made me come back to. 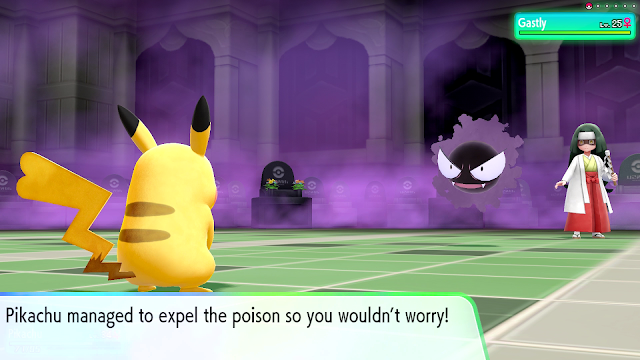 Pokemon Let’s Go starts exactly how I remembered a typical Pokemon game starting. You select your appearance, yours and your rival’s name and then your journey begins with you waking up on the day you’re supposed to pick up a Pokemon from the Professor’s office, this time from the familiar Professor Oak from Pokemon Yellow and the Pokemon anime. Your first Pokemon is already chosen depending on if you bought Pokemon Let’s Go Pikachu or Let’s Go Eevee, with your Eevee or Pikachu being the first Pokemon to enter your party in an adorable series of cutscenes that’ll likely please any fan of either. Along with your goal of becoming the best Pokemon Trainer, the Professor gives you a Pokedex and true “Gotta Catch ‘Em All” spirit tells you to fill the Pokedex as much as possible as your journey of exploring and getting gym badges begins in this world full of Pokemon. With the nostalgic goals I remembered from the Pokemon games I played when I was a kid, I had fun rediscovering the kind of Pokemon journey I had so much fun doing as a kid and seeing how it played out in this much better looking-version. There are the eight gym badges to collect just like I remembered, with little Team Rocket intervals along the way bringing in characters I knew from the anime like Jesse and James and cameos from Brock and Misty in their gyms and other things from the anime and original game made getting back into it smooth and fun. All of these familiar things have been visually overhauled so much so that you could forget that Pokemon Yellow originally all pixels thanks to how seamlessly this new visual style takes on the old layout in a colourful modern way. It was amazing how good certain dungeons like Team Rocket’s hideout felt with their puzzle-like areas that are more reminiscent of older games, but were still fun and interesting to do in Let’s Go thanks to good design and a fresh coat of paint, and is a true testament to how good the original game was and how well it’s been brought into Let’s Go that make what is essentially a refresh of an old game feel fresh and innovative all over again. 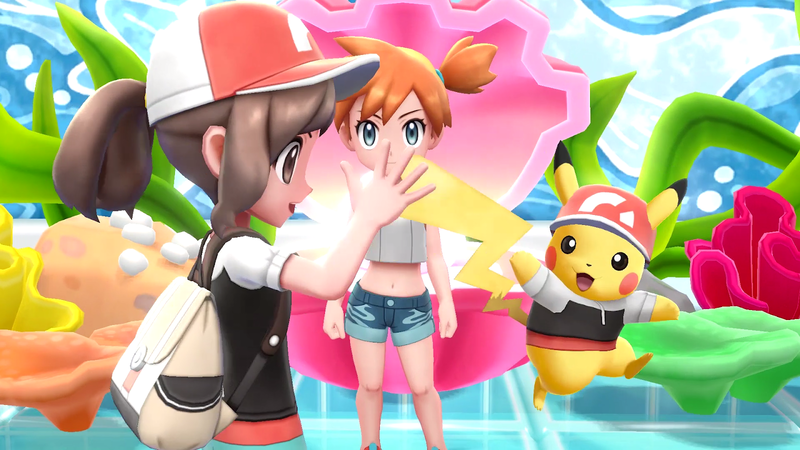 Helping Let’s Go feel fresh and modern are the mechanics brought in from Niantic’s Pokemon Go games for capturing, which I was a little concerned about initially as I worried they’d take away from the fun JRPG grind-fest that used to be my time with Pokemon games. I had nothing to worry about though, as having battles and capturing be mostly separate in Pokemon Let’s Go made both these things feel much more focused and there’s more than enough of both so I never felt like I was missing out. Rather than having random battles in grassy areas, you can visually see what Pokemon are around on the field and approach the ones you don’t have or want more of and skip whatever you don’t need, which made gameplay feel a lot better since all battles or capturing sessions were expected and with purpose. Catching is done by getting the Pokeball in the circle like in Pokemon Go, which also uses similar extra things to up your chances, with Razz Berries making Pokemon easier to catch and Lures attracting more rare Pokemon while you run on the field. I ended up preferring this way of capturing Pokemon to the old system as it’s very easy to see and understand your chances of actually getting a Pokemon and the only reason I wasn’t able to catch Pokemon at times was because I didn’t have enough Pokeballs or Razz Berries, rather than accidentally critical hitting the very Pokemon I wanted to catch in the old games. It’s a definite stray from the original system, but I think it’s a step in the right direction and wouldn’t at all mind if these systems pop up in future Pokemon games to keep the cleaner catching experience. Since the nature of catching Pokemon is more streamlined than before, this gave me more time to strategize and enjoy Pokemon battles as I rediscovered its more familiar battle system. It’s mostly the turn-based combat I remembered from the older Pokemon games, just with cooler looking attacks and flashier looking special moves, with the simple system of choosing from your four moves and trying to attack with contrasting elements all present in Let’s Go. In a way, I found it surprisingly nice that the system didn’t explain itself too much and just let you go in with trial and error, despite the fact I had completely forgotten for the most part how certain elemental weaknesses worked, so re-learning this encouraged me to not just use my powerful Pikachu to take everything down sometimes and test what works by using Pokemon with other elements to get the most out of my team. In saying that, an overpowered Pokemon like your partner one can get you pretty far in Pokemon Let’s Go, but only if you play things smart and I liked that the basic system encouraged that. I kept my Pikachu ready with Electric and Fighting moves to take on the enemies that it was usually strong against elementally and a few more, which seemed to get me through a lot of the game, but I was also faced with a few battles that sent me to the Pokemon Center when I was careless, so the game is not without challenge. Perhaps if you’re a veteran of the series Let’s Go will be easier, but as someone coming back to Pokemon after a while, I think the difficulty was just right for getting back into the swing of things and learning the system if you’re new. 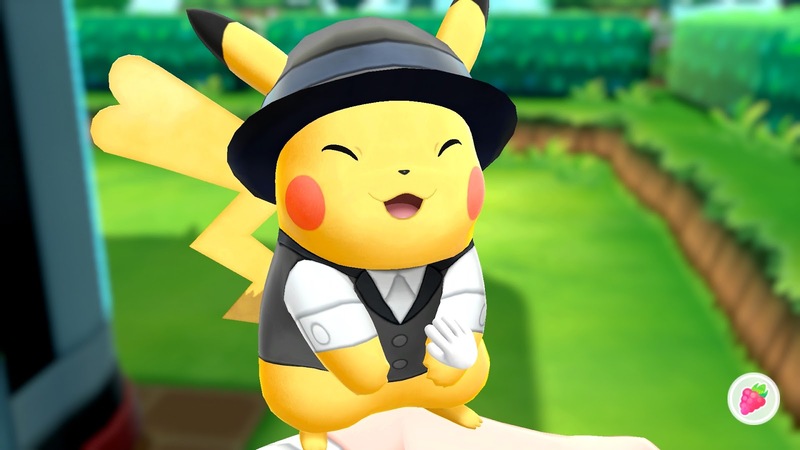 There’s a lot of emphasis on having a partner Pokemon and bonds with your team in Pokemon Let’s Go, with Pikachu and Eevee serving as your main partner Pokemon that you can dress up and pet to feel a deeper bond with them and witness some general adorableness. This bond isn’t just imaginary though, as the more I did things with my Pikachu, the more it would randomly do extremely helpful things to impress me in battle sometimes, such as doing a critical hit for a little bit of praise or getting rid of status ailments so I didn’t have to worry. Bonding isn’t just for Pikachu and Eevee; I seemed to also get similar reactions from Pokemon I had follow me on the field or ones I took with me using the Pokeball Plus, so if you’re a fan of other Pokemon, while you can’t get the exact same benefits of as Pikachu and Eevee, you can get benefits for other Pokemon you like too. And speaking of the Pokeball Plus, it’s basically a gimmicky little controller to use with while playing Let’s Go, but since one of my joycons likes to go crazy with with analog stick since I need a new one, I really enjoyed playing with the ball during most of my time with Let’s Go and it did kind of ignite that childhood fantasy of holding and throwing Pokeballs, so it’s a bit of fun if you don’t mind paying extra for it. The only downside to it is that using the Y button to sort menus is pretty hard and some things you just can’t do like check what attacks do in battle since it’s reserved for special attacks. For sorting, I could sometimes get it to work by randomly hitting the ball against my hand, but it wasn’t ideal as this only worked sometimes. Using the Y button is mostly for optional features though, so this being an issue will depend how much you need it in your own playthrough. 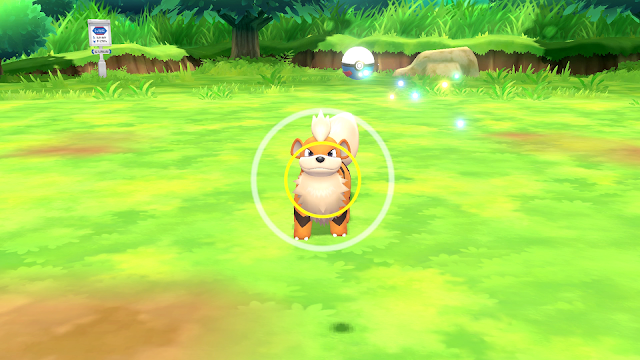 While it’s hit or miss for actually playing Let’s Go, the fun part of the Pokeball Plus is being able to take your Pokemon from the game out with you in the ball to gain extra experience and raise your bond with them. After keeping it in my bag, I found it so cool to come home after my usual day of working and commuting and seeing my chosen Pokemon level up a few times just for coming out with me and although you don’t have to do much other bringing the ball, it’s a really cute idea that traveling with you makes them feel happy and gains in-game experience and candies supposedly found on the stroll. On top of just walking, you can also play with them in the ball by shaking and rolling it to make the Pokemon extra happy, just make sure to hold the analog stick down and then the top button to put it on silent, something I had to Google when my Pikachu proudly proclaimed its existence while I was walking around, which was adorable but could be a problem if you bring it to work. Outside of permanently keeping my Pokeball Plus in my bag, there is plenty of replayability to be had once you reach the end of Pokemon Let’s Go’s main campaign. I have about 70 more Pokemon I could go and catch to complete my collection, including the ones I imported from Pokemon GO, there are new battle challenges I can do and rare Pokemon to find such as Legendary’s hiding in extra caves and areas around the map. Something I’ve always loved about Pokemon is how easy it is to jump in and out of it and choose if you want to go deep into it or not and I feel this with Pokemon Let’s Go as well - I know I won’t be able to get to it again soon, but I know when I do, all I have to do is look at my Pokedex, see what’s missing and go from there, and before that I can keep bringing my Pokeball Plus with me on the go so that when I do come back to it, my Pikachu isn’t too lonely and will be able to keep gaining EXP for the next time I’m back and I’m sure the Pokeball Plus will keep it fresh enough in my mind that I come back soon. Combining a tradition Pokemon game like Pokemon Yellow with the Pokemon GO catching mechanics works surprisingly well in this great-looking modern tribute to the original Kanto Pokemon games. It keeps the nostalgic charm of Pokemon games in tact with its familiar game flow and maps all upgraded to work in a more modern way and compliments its gameplay that’s easy to pick up for series veterans and newcomers or people returning to the series thanks to its simplified mechanics that combine old and new ones well. 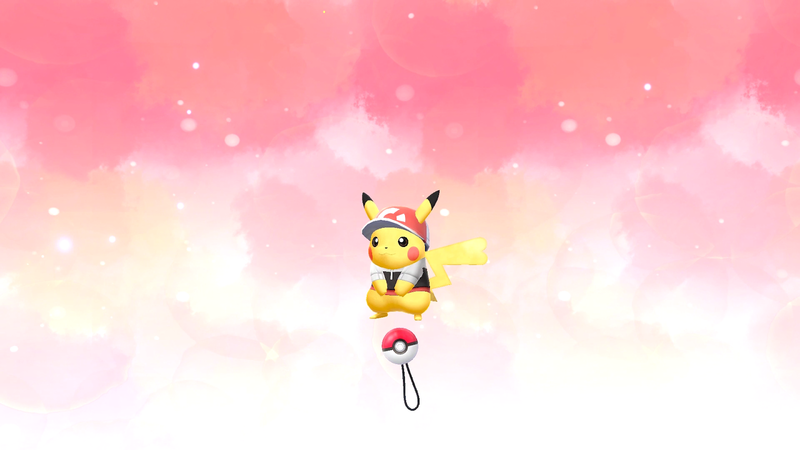 I’m happy to say that Pokemon Let’s Go is the first Pokemon game I’ve finished in a long time and will likely not be the last as it was a good reminder of how fun of a series it really is and with great visuals and a streamlined approach to classic working so well in Let’s Go, I hope we see more of this kind of system again in some kind of Pokemon game in the future. Still wanna catch 'em all. You can pick up Pokemon Let's Go Pikachu and Let's Go Eevee on Amazon! 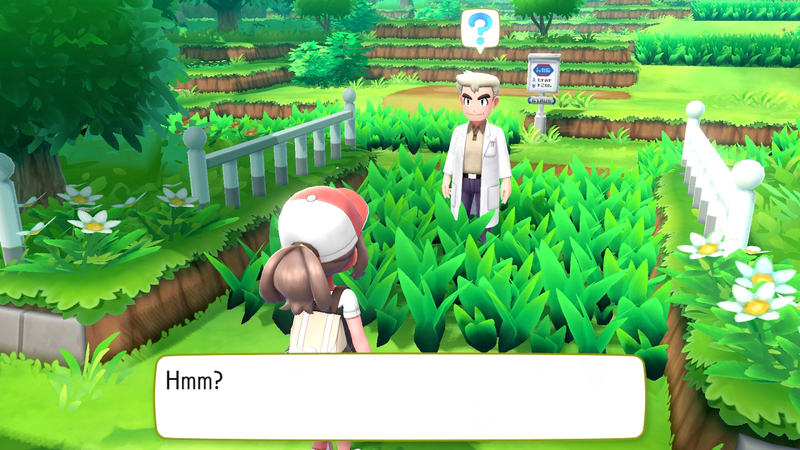 Have you tried Pokemon Let's Go? If you did, what did you think of it? Do you have any other Pokemon recommendations?